Microsoft Virtual PC (2004 and 2007) does not work at all on Windows 10 64-bit, and even on 32-bit platforms lack internet connectivity due to the lack of the VPC driver. This also impacts Windows Mobile emulators. 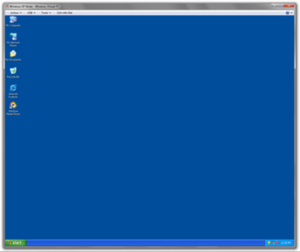 Internet Explorer versions 6, 7, and 8 run concurrently on a Windows 7 Release Candidate desktop using Windows XP Mode. —  Ben Armstrong, "Virtual PC Guy"
^ a b Heng, Christopher. "Free PC/Intel x86 Emulators and Virtual Machines". thefreecountry.com. TheFreeCountry. Retrieved June 16, 2013. ^ "PC in a Mac". Yale Engineering Home newsgroup. University of Yale. April 8, 1997. Retrieved March 21, 2015. [...]Connectix Virtual PC is designed to run on Power PC systems running System 7.5 or later. Pricing will be announced when the product becomes generally available for the retail channel in June 1997. ^ Protalinski, Emil (May 15, 2008). "Microsoft releases Virtual PC 2007 SP1". Ars Technica. Condé Nast. Retrieved June 16, 2013. ^ "Description of the hotfix rollup package for Virtual PC 2007 Service Pack 1: February 20, 2009 (revision 2.0)". Support. Microsoft. October 8, 2011. Retrieved June 16, 2013. ^ Faden, Michael (May 13, 2009). "Selling Windows 7 to Enterprise" (PDF). acommit.ch. Acommit AG. Retrieved June 16, 2013. ^ "Installing DOS additions under VPC 2007". Ben Armstrong's Virtualization Blog. Microsoft. October 31, 2007. Retrieved June 16, 2013. ^ "Installing Windows 98 on Windows Virtual PC". Blogs.msdn.com. Retrieved June 16, 2013. ^ "Using Virtual PC 2004 Additions to Enhance the Windows 2000 Guest Experience on Windows Virtual PC". The App Compat Guy. Microsoft. July 19, 2010. Retrieved June 16, 2013. ^ "Download Windows Virtual PC from Official Microsoft Download Center". Microsoft.com. Retrieved July 19, 2017. ^ a b "Windows XP Mode for Windows 7 brochure" (PDF). Microsoft corporation. 2009. Archived from the original (PDF) on August 25, 2016. Retrieved July 19, 2017. ^ Rivera, Rafael; Thurrott, Paul (April 24, 2009). "Secret No More: Revealing Windows XP Mode for Windows 7". Within Windows. Retrieved June 16, 2013. ^ a b Davis, Megan (May 24, 2005). Blade, Tina (ed.). "Virtual PC vs. Virtual Server: Comparison of Features and Uses" (Microsoft Word). Microsoft Download Center. Microsoft.com. Retrieved July 10, 2009. See also download details. ^ a b "Readme for Microsoft Virtual PC 2004 Service Pack 1". Download Center. Microsoft. October 12, 2004. Retrieved July 10, 2009.